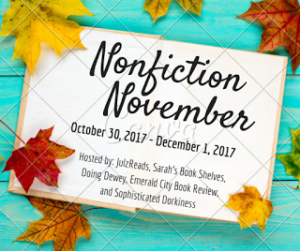 It’s time for the weekly post for NonFiction November. This week is ‘expert’ week. The discussion is being hosted by Kim at Sophisticated Dorkiness. Here’s the prompt for the week. I’m choosing Be The Expert. In keeping with my theme from yesterday’s post, let’s continue the bookbinding talk. It occurred to me that I’ve been bookbinding on and off for about 14 years. That’s a lot of paper & glue in this household. So if you’ve ever thought about the process of bookbinding and or wanted to give it a try I rounded up some books that I think would be fabulous. Two books that I love are 500 Handmade Books Vol. 1 & Vol. 2. These books are pure eye-candy and a great way of seeing books as art. There are books that don’t quite look like books, bindings of all sorts and books of all shapes and sizes. Some of the books featured in these collections have been made by teachers I’ve taken classes with so it was exciting to see that when I got these books. 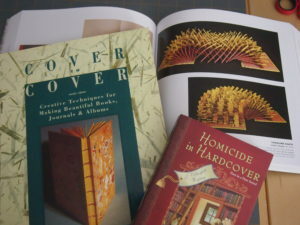 If these two make you want to give bookbinding a try then one of my favorite technique books is Cover to Cover by Shereen LaPlantz. I have had this book for years and I still reference it. There is an invaluable section on tools, thread, adhesives and then of course the techniques. Great instructions so you can’t go wrong with this one. Another book I recommend which I forgot to include in the picture is Handmade Books by Kathy Blake. I don’t hear too many mentions of this one but this was a lucky find for me at a Half Price Books several years ago. It has very nice pictures, goes through various bookbinding techniques which are great for a beginner and even has directions on how to make bookcloth. Finally, I’m cheating a bit because this is fiction but I couldn’t resist adding this mystery Homicide in Hardcover by Kate Carlisle. The series features Brooklyn Wainwright, a bookbinder and restoration expert. So while there’s always a dead body she’s dealing with in this series, you can also see what some bookbinders deal with when it comes to books in bad shape, first editions, and custom orders. 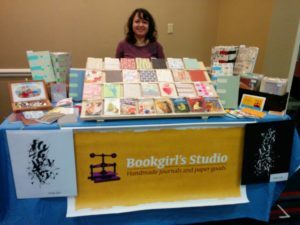 She talks about special books and other adventures in bookbinding. And, just for kicks I’m adding this picture which I think I’ve shared before. It’s of me with my journals and some of my husband’s calligraphy at one of my craft shows a couple of years ago. I haven’t done a show in a while and I do miss it. It’s a lot of work and unfortunately it’s a bit too late for me to do any this year but maybe I’ll get back into that next year. So I hope you enjoyed this. 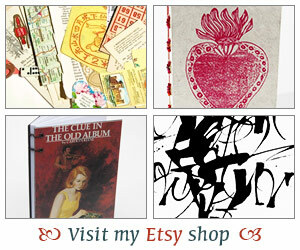 Hope I piqued your interest in bookbinding or maybe you’ve dabbled a bit in it before. Would love to hear your thoughts. Can’t wait wait to catch up with what others are posting for this week’s November Nonfiction posts. I’m not sure I’d ever try this, but your finished project (I read about the junk journal in your next post) is so pretty! It looks like you have a lot of fun with these. What a fun topic! I remember making little books for my kids a long while back … it would be so much fun to see real books being made. 🙂 A great topic for readers! Bookbinding sounds like a fascinating topic! I’ve never tried to actually make a book, but I’d like to. Thanks for sharing! What an unusual topic… you are very talented! I always love your journals and thanks for some good titles on making handmade books. 🙂 I also like that you included a fiction pairing–fiction often provides both inspiration and tips concerning real-life information! It’s a good way to use both your mind and your fine motor skills. Hope you do shows in 2018! This is such a fun topic! I’ve never tried bookbinding, but really love collecting beautiful notebooks. Thanks for joining us this week! Oooh, I would love to gaze at those beautiful books and the fiction pick sounds fun too. Thanks! As I’m going through my book shelves and documenting the books I own, I came across y Homicide in Hardcover, so it’s funny you mention it! It’s one I haven’t yet read yet, but I’ve had it for years now. I’m finding quite a few books I had forgotten I had! You chose a great topic for you, Iliana! You are good at what you do, and it’s great that you take such pleasure in it. Great picture of you at the craft show, you look very happy! Bookbinding sounds like a great craft to get into. I bet shows are simply exhausting, but probably also really inspiring? Thanks for the peek into your corner of the world and happy bookbinding!